Well Christmas came a little early for our family today. It all started when Jason and I were sitting in church this morning. The sermon had ended and we were about to sing the final song when Jason reminded me that last year on this Sunday we had gone up to the front after church and had been prayed for by our Pastor and Elder team as well as many friends before we left to go to Toronto the following day. Oh wow… remembering that prayer time and what we had prayed for made me cry – as even then we were still hoping that God would reach down and heal Ava and spare her life. So it’s a year later and we know now that healing Ava was not in God’s plan, and it’s sad because we miss her so much… and it’s hard not to think about what might have been. So I was still a little sad after the service when I remembered that a dear friend had asked us to meet her between the services. When Jason and I found her, she led us around the corner to where a group of people were waiting – which was all very surprising – and low and behold they presented our family with the most amazing gift ever… my entire blog posts of Ava’s life from start to finish put in photo books. For real… every single blog entry and picture. What an incredible gift and such a wonderful keepsake. Then the tears really came, but we all marvelled at God’s timing. Just that this book had been in the works for so long, and they had hoped to give it to us before this week, but God knew that today was the day that I needed it most – just to show me once again that He is always faithful and cares about us so much. And so we wanted to say a HUGE thank-you to Nancy who did all the work – and I’m sure it took weeks and weeks or even months of hard work to put it all together – we are eternally grateful. And to all of our Harvest Family who made it possible, this gift means more to us that you’ll ever know. 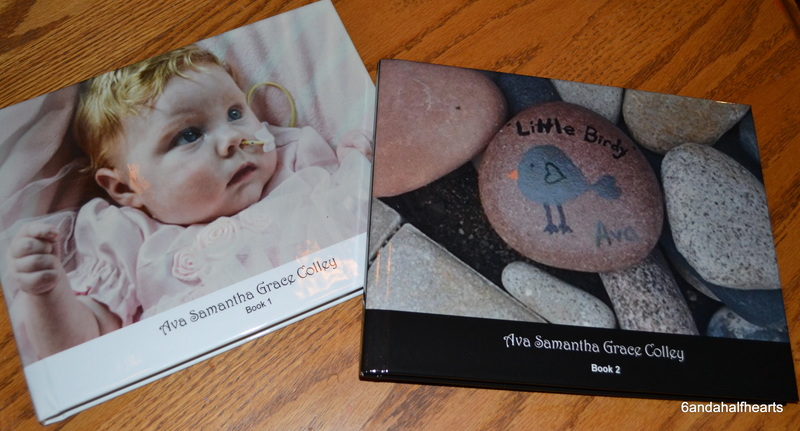 And not only did Jason and I receive a set of photo books – Volume 1& 2 – but there was a set for each of our children – their very own keepsakes forever. 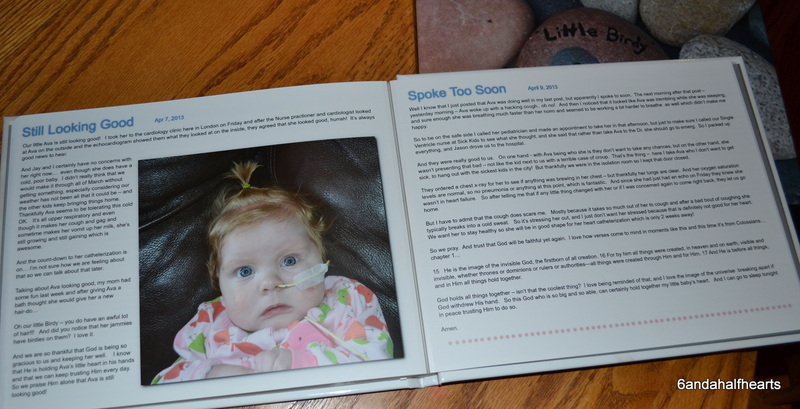 When we got home we were all sitting in our family room looking at our books and my heart was just over-come that we can go and read about Ava and look at her pictures whenever we want and that my kids will have these books to remember their sister by as she gets older. Wasn’t that a marvelous way to start December? The month where we start to look forward to Christmas – the day we celebrate the birth of Christ… who came to give us the best gift we could ever receive… eternal life. We are so blessed. God is truly the giver of good gifts. I have some great news for everyone, but I will keep you waiting and first tell you that little miss Ava had another great day. Our plan was to go to church today, so when I accidentally woke up early this morning I to put it to good use by getting the kids ready and dressed to help Jason out, and then I left the rest of the getting ready to him and went to visit Ava. And Ava was so happy to see me! I got some cuddles and lots of smiles from her and we both really enjoyed our quick visit. Then Jason and the kids picked me up from the hospital and we went to church at Harvest Toronto West . And there we heard a great sermon about how God always has a plan, God’s plans are always for His glory, God’s plans are always for our good and that we must believe that God’s timing is always perfect. Can you believe that was the sermon? Seriously it was, I kid you not. Little did the pastor know that he was delivering a sermon tailor-made for us. And even though these aren’t new concepts, I think it was perfect time for a reminder of these truths. But in terms of God’s timing being perfect, I am so excited to tell you that our little friend Aleeda from the hospital got her new heart Friday!!!! She did!!! It’s so incredible, because after waiting one full year, she finally received a heart transplant and the wait is finally over. I am rejoicing with her family and I am so thankful that God has answered all the prayers that had gone up on Aleeda’s behalf. God is good. Now, just because Aleeda has received a new heart doesn’t mean that everything automatically is well with her… she is still in critical condition and her chest isn’t closed yet, so please please be in prayer for her as her body adjusts to this new heart. Just think, all of her organs and brain and even her blood vessels need to become accustomed to a good steady blood flow, something that she hasn’t had in a really long time. But she is a fighter this little one, and I know that God is going to carry her through this. It’s certainly my prayer that God will carry her through as Aleeda has definitely found a place in my heart. She had a room right across from Ava’s, and even today I missed seeing her cute little face smiling at me from her high-chair in the hallway. She used to lure me over to her by making her kissing face, even though most of the time when I went over to her she just allowed me to kiss her. She loves Ava and always smiled when she saw her and her mom has become a wonderful friend to me. I have been so inspired by how patiently Aleeda’s mom Tanya waited for this heart, the staff at the hospital loved her and so they should, as Tanya never grumbled or complained. Tanya also has a strong faith in God and we both knew that He had a plan, and it’s so amazing to see God’s plan and timing finally come together. And it’s another reminder that God can bring a heart! And so we ourselves just keep giving Ava to God, knowing that she is His child first and foremost and even though this waiting for a new heart – or perhaps God’s plan to ultimately heal Ava in heaven – isn’t an easy road to travel, we can trust God and wait for His perfect timing. 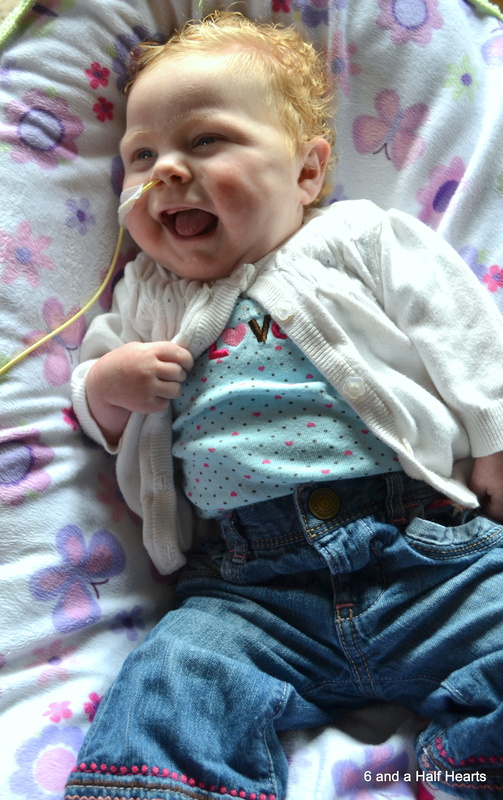 Next Sunday – May 5th – Lord willing – we are dedicating Ava at church and you are all invited! I mean it! Even if you don’t normally attend church, if you have been following our story, you live in our area and are free next Sunday, we want you there to see Ava and share this time with us as we dedicate this little Birdy…. When we dedicate a baby at our church it means that we are publicly acknowledging that our child is a gift from God, and we ask for help in our endeavour to raise that child according to God’s word – the Bible. And because we have so much to be thankful for regarding Ava, Jason and I have been given an opportunity to say a few words about our journey and I know I’m going to cry buckets, and I would mean so much if you could join us. Please see this link – Harvest Bible Chapel – for service times and information – and you can always email me at 6andahalfhearts@gmail.com for more information. And you can definitely bring your kids as there are programs running for them during both services up to grade 5. We will be sharing our story at both services on Sunday so you can choose either one. We are so grateful to God for His goodness and since Ava doesn’t normally go to church because of risk of infection, it will be so nice to have everyone together. If something unexpected comes up – like another hospitalization – we will have to change the date, but we will post any information regarding that here on our blog. So don’t be shy, please please come, we want you there.